I will explain how to create a bootstrap navigation menu bar using content search web part in SharePoint 2013. In the first step, let’s create the authoring and publishing site collection. Authoring Site collection allows authors to manage their website content while the Publishing Site collection reviews the content from the authoring site collection. 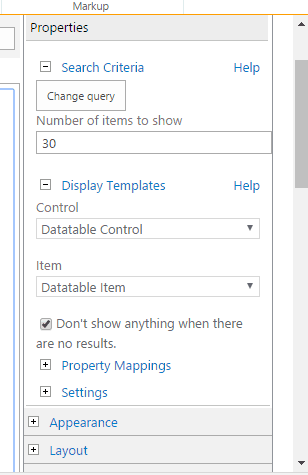 In this article, I have explained how to create a jQuery datatable using content search web part (CSWP) to Bind data in SharePoint server 2013. In the first step, let’s create the Authoring and Publishing Site Collections. Authoring Site collection allows authors to manage their website content while the Publishing Site collection reviews the content from the authoring site collection. Open the Authoring Site Collection. In that site collection create a list named “Employee Details” that contains Employee name, Employee designation, Employee ID, Employee designation, Blood group, Email, and Mobile. Let’s go and create a control and a template to display the items. It provides the overall structure (layout) of the HTML elements along with start and end tags. It renders the items from the list, and contains text and pictures. Now, let’s create two display templates for displaying a bootstrap carousel menu control and a menu item. Upload the script and CSS into style library. Add the scripts and CSS into Control template. The full code looks like the following. Let’s go to Item template and declare the managed properties and necessary variables. Render the HTML structure with the list item information. Overall Item template code looks like the following. Upload the display template under Site Settings – > Master page and page layouts -> Display Templates -> Content Web Parts. Now going to insert some data into Employee details list from authoring site collection. Run the search service application Crawl now. Now, let’s go to SharePoint page. Add a Content Search Web Part into this page. Map a search query to get the result from the authoring site collection. Click Edit Web Part -> change query. Provide number of items to display. Click OK. Under property mapping section, map the managed properties of the Employee name, Employee designation, Employee ID, Employee designation, Blood group, Email, and Mobile. Click OK to complete the setup. The following is the final result. How to create website in Microsoft Azure from Azure Portal? The result has been displayed using Search Service. You need to run the Search Service application. After adding the content into the SharePoint list, the result will be successfully displayed into the page. Next Article How to rename SharePoint 2013 group using browser and PowerShell?